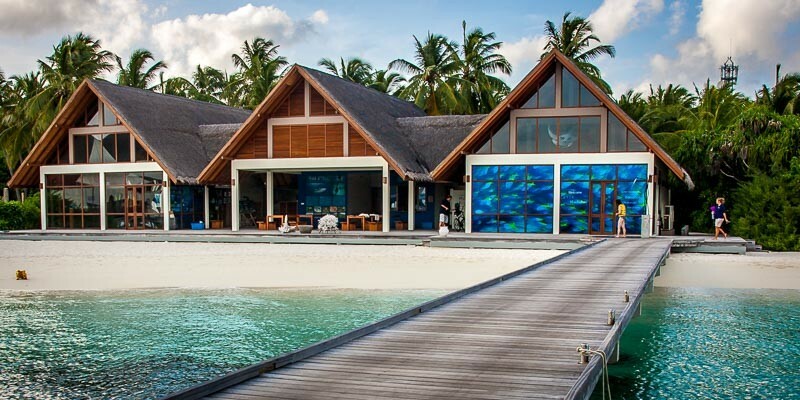 The Marine Discovery Centre at Four Seasons Resort Landaa Giraavaru showcases the different environmental projects carried out at the resort. These include Reefscapers coral reef restoration, fish culture, conservation of sharks & manta rays and sea turtle rescue & conservation. The Marine Discovery Centre aims to increase the environmental knowledge and awareness of the public, including resort guests and the local community. Seamarc also manages the Marine Discovery Centre at Kuda Huraa, and combined we make one of the largest teams of marine biology experts in the country as ‘Marine Savers‘. During the construction of the resort, as many corals as possible were salvaged from the construction areas and a new technique for creating artificial reefs in shallow lagoons was developed in order to create aesthetically pleasing reefs and dedicated snorkelling trails. Seamarc developed a specialised fish breeding laboratory, designed to research and breed various species of ornamental fish. In addition, we have an impressive open-circulation 4m2 aquarium. The Baa Atoll Youth Project aims to increase awareness among the local islanders through the youth of Baa Atoll, thus aiding the government to effectively implement conservation measures in the Maldives. The objective of the project is to build the capacity of the youth in the atoll to be proactive in environmental protection. Youth workshops are organised by Four Seasons, to focus on specific issues and increase awareness on sharks and turtles and also effective management of Hanifaru as a marine protected area. The project hopes to increase the role of youth in managing the atoll through capacity building and awareness raising. Waste management is the biggest environmental challenge in the inhabited islands of the Maldives. Thilafushi is the sole municipal waste facility in the country and the outer islands do not have the financial means of transporting the non-biodegradable waste to the site. The Island Waste Management Project aims to establish waste management systems in Kamadhoo, Kihaadhoo and Dhonfanu. During the process of implementation, the local people are made aware of the importance of taking responsibility for the waste they generate. They are also taught about waste segregation at the household level. The island required coastal structures to be designed and constructed for protection against erosion. In order to mitigate the impacts from resort construction, coral translocation works have also been carried out. The artificial reef created will enable snorkelling guided tours during which a dedicated marine biologist will present the works and increase the awareness of both the guests and staff. A survey was carried out on nearby local islands who were willing to sell coconut palms to be transplanted in Landaa Giraavaru and a report was produced detailing methodology of translocation, associated impacts, mitigation and monitoring.